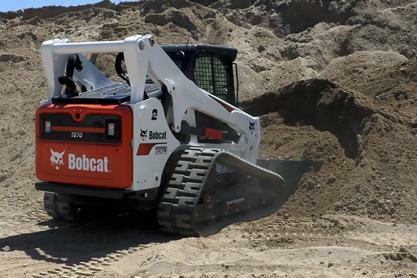 When you operate a Bobcat® T870 compact track loader with the 5-Link torsion suspension undercarriage, you’ll immediately notice the difference. It dramatically reduces stress and vibration from the undercarriage, making your ride more comfortable. It’s a difference you can feel through the entire machine. Engineered for reliability from the start, the 5-Link torsion suspension undercarriage will stand up to the most demanding jobsites. 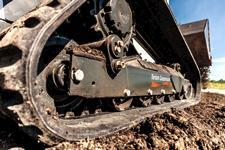 Every component has been designed to withstand the toughest jobsite conditions. It starts with an improved drive motor, which is continuously lubricated from the hydraulic system, leading to a longer life. Other components are much larger and more durable, including the shaft inside the gearbox, track rollers and rear idler. Hydraulic hoses are carefully routed inside the undercarriage, free from potential snag points. Torsion suspension systems on other brands of loaders commonly suffer from “rocking” or “bouncing” motion, especially when grading material or lifting a high load. 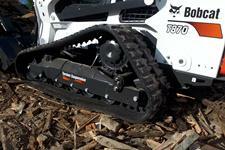 To eliminate this motion on Bobcat loaders, a unique fifth link was engineered in the rear axle. It operates like an independent suspension system, greatly reducing the effects of typical torsion undercarriage systems from other manufacturers. 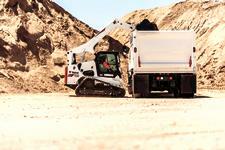 For you, that means better grading and increased stability when loading material into a high truck. When it comes to torsion suspension ride quality, no other manufacturer comes close. Each component works together to efficiently absorb jobsite stress while you’re working. An additional pivot point improves ride quality and a unique fifth link included in the rear axles provides greater stability. Other components like wider track rollers, dual flange front idlers and a longer track further improve the ride of your machine. Jobsite noise and vibration makes your work uncomfortable. With the 5-Link torsion suspension undercarriage, you’ll experience reduced vibration and improved sound dampening. 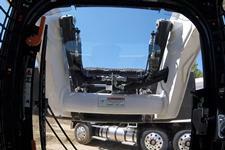 An additional pivot point in the undercarriage reduces vibration. Torsion axles also dampen vibration and make your ride smoother. 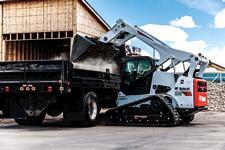 You’ll feel the difference in every part of your operating experience throughout the machine. 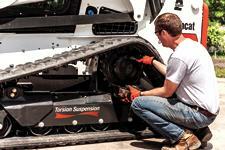 Cleaning your loader’s undercarriage after a long day has never been easier. A horizontally-mounted hydraulic track tension cylinder opens up more room between the carriage and track to give you better access to components. And the undercarriage is sloped on both sides, which helps it shed material, such as sand, dirt, mud and debris, reducing the amount of cleaning work you have to do in the first place. Additionally, a new roller cleanout opening and raised cutout between the rollers make cleaning even easier. Whether you’re working in construction, on the farm, tackling a landscaping project or managing facilities, you’ll experience increased durability, reduced maintenance and better comfort with the 5-Link torsion suspension undercarriage. For construction workers, durability and reliability are requirements. Long-lasting components like solid cast steel rollers and idler mounts, high-quality steel grease zerks, and forged steel front idlers give you peace of mind on every project. Beef, dairy and crop producers will appreciate the added stability when loading material into high-sided trailers and the straightforward serviceability. Five easily accessible grease zerks make regular greasing intervals fast and easy. Landscapers will appreciate the added stability, especially when lifting heavy materials like pavers, rocks or gravel into high-sided trucks. And with industry-leading durability, you can take on work in the harshest conditions. 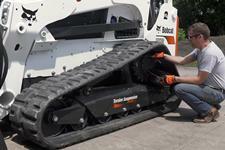 Plus, reduced vibration will keep you comfortable all day long, even when operating over hard, uneven surfaces. For grounds maintenance workers, 5-Link torsion suspension undercarriage provides industry leading comfort and durability. Whether you maintain a golf course, municipal property, or college campus, reduced vibration will keep you working all day with less fatigue. 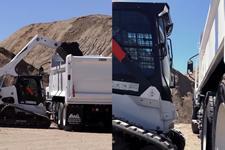 And with better overall stability, you’ll be able to operate a wide variety of attachments with confidence. When you’re not working, you’re not making money. It’s the reason each component is engineered for day in, day out reliability. Drive motors are lubricated from oil from a separate cavity of the hydraulic system, dramatically increasing outer bearing life. The diameter of the drive shaft inside the gearbox is 15 percent larger. 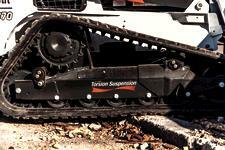 Wide rollers maximize contact with the tracks and last longer. It’s also easier to flush and fill the drive motor reservoir with two easy to access service ports. 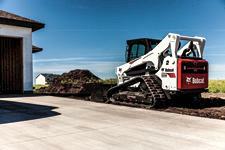 Engineered for performance, 5-link torsion suspension undercarriage will propel you to new levels of productivity on your jobsite. For instance, the front roller and idler mount are engineered out of cast steel and iron for increased durability. 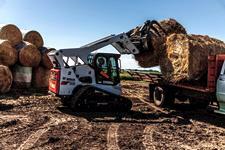 An additional link on the rear axle adds stability, decreasing the “rocking” or “bouncing” motion commonly associated with other loader brands. 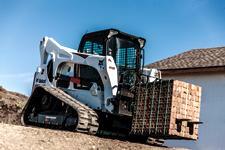 In addition to unmatched durability, the 5-Link torsion undercarriage brings an entirely new level of comfort to Bobcat loaders. 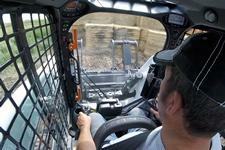 Inside the cab, you’ll experience reduced sound levels and feel the smoother ride in the seat, floor and controls. Because of the additional pivot point and torsion axles, the stress and vibrations of your jobsite are effectively absorbed. A unique fifth link on the suspension system operates like an independent suspension, which greatly reduces the “rocking” effect other manufacturers struggle to eliminate with typical torsion undercarriage systems. The longer track includes wider rollers and dual-flange front idler, which rides on rubber to further reduce vibration. Five easy-to-access grease zerks make regular greasing intervals easy and simple. They’re also recessed for natural protection from jobsite objects and debris. Automatic hydraulic tensioning system increases uptime by ensuring the proper track tension and eliminates the need to manually make adjustments with a grease gun.